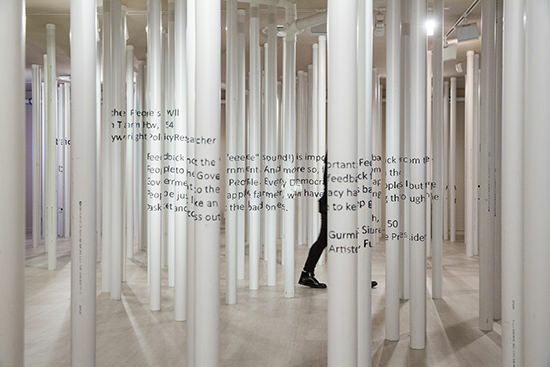 Visit Fremantle Arts Centre and you’ll find yourself in a forest of 300 PVC pipes on which are inscribed words that will only add up from certain fleeting perspectives. Your exploration will be surveilled in real time and projected onto large screens. 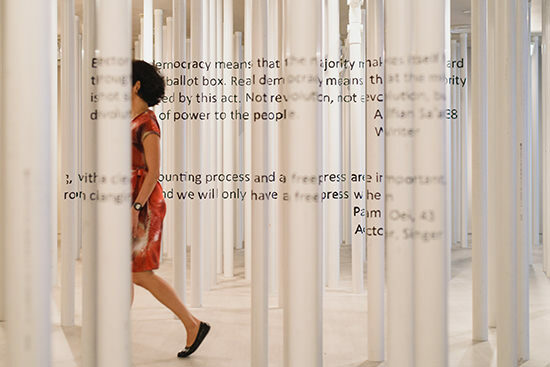 In the context of a work about democracy—the words come from 10 Singaporean citizens’ thoughts on the subject—this is possibly ironic, as is the way in which the statements form and dissolve without allowing certainty. Such is the nature of democracy today, threatened by a widespread rise of demagoguery and intolerance. But irony is incidental to Matthew Ngui’s Every Point of View; rather it’s a celebration of co-existence and tolerance, a purpose underlined by the work’s singular beauty as glimpsed in images from its appearance as one of five major works commissioned by Singapore Art Museum to mark 50 years of the nation’s independence. Sonic elements lend the work an even greater immersiveness: the voices of the 10 subjects can be heard and the audience can have their own thoughts about democracy broadcast through the space by speaking into the pipes. Also showing is Ngui’s Swimming; at least 8 points of view (2008) “a 15-metre wide projection, which follows the artist swimming up and down a pool; [it] will fill the main gallery” (press release).